Tiaras, coronets, ribbons and robes – plus nine princesses-in-waiting! 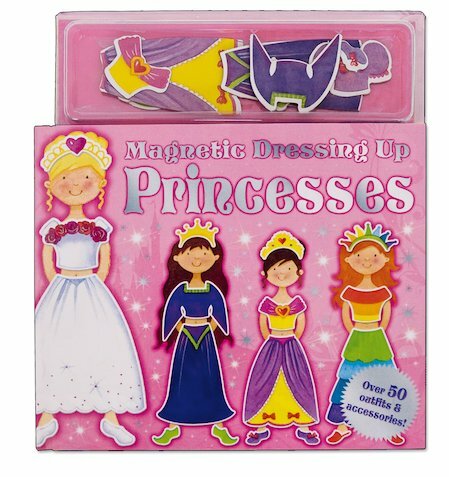 Turn them into true princesses with these gorgeous dress-up magnets! Inside this spangly magnet book of costume surprises, you’ll find nine beautiful princesses to dress up. Open the door to your magnetic wardrobe, and see if you can pick an outfit to make each girl smile. You can dress them in their favourite robes, gowns, ball-dresses and jewels, or mix and match their clothes for a dramatic new look. Make them look like royalty! Dress them up! Book contains nine magnetic scenes plus magnetic outfits to mix and match.